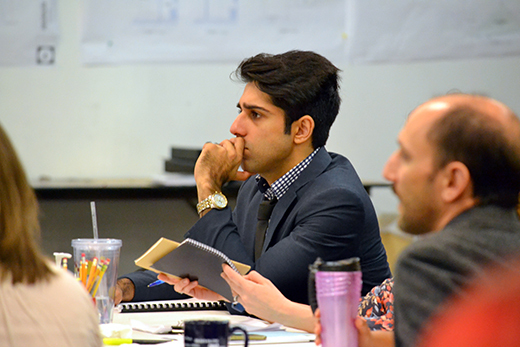 Jaspal Binning, shown here on the first day of rehearsals for the Alliance Theatre's performance of "Disgraced," stars as Amir Kapoor, an American lawyer distancing himself from his Muslim roots. The prize-winning play is the topic of an "Ethics on the Stage" discussion at Emory on Jan. 19. Photo by Kathleen Covington. The Emory Center for Ethics will host a public discussion and theatrical reading of select scenes from the Alliance Theatre’s current production of the Pulitzer Prize-winning play “Disgraced” on Tuesday, Jan. 19, at 7:30 p.m. The free “Ethics on the Stage with Alliance Theatre” event will be held in Room 102 of the Emory Center for Ethics Commons, which is located in the Rita Anne Rollins Building. Those planning to attend are asked to register in advance. Winner of the 2013 Pulitzer Prize for Drama and a Tony Award nominee for Best Play, “Disgraced” tells the story of Amir Kapoor, a successful lawyer who is rapidly moving up the corporate ladder while distancing himself from his Muslim roots. When Amir and his wife Emily host a dinner party, friendly conversation quickly explodes into something deeper and more dangerous. Described as a turbulent thrill ride, “Disgraced” examines an American identity far more complicated than any melting pot. The play will run on the Alliance Stage from Jan. 27 to Feb. 14. For ticket information or to learn more about student discounts to the performance, visit the Alliance Theater website. Cast members from the Alliance Theatre production will perform readings from the play at the Jan. 19 ethics discussion — a program partnership between the University and local theater that stretches back more than five years, says Carlton Mackey, director of Emory’s Ethics and the Arts Program. Given today’s political climate, Mackey says he can’t imagine a more important time to pause for ethical reflection upon the issues that the play raises. Audience members at Emory will have a chance to preview and process what they experience at the reading, then engage in a follow-up public discussion. Often called the most-produced play in the United States during the 2015-2016 theatrical season, "Disgraced" is soon to become an HBO movie. It contains profanity, extreme violence and adult thematic elements, and is not recommended for those under the age of 17. For more information, visit ethics.emory.edu.